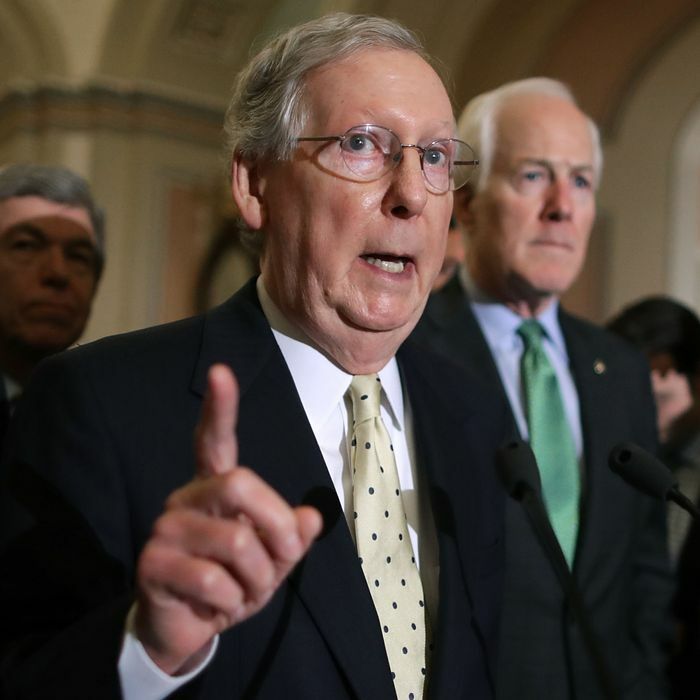 McConnell may have lost this fight just by picking it. As Republicans fumble around in the dark trying to repeal the Affordable Care Act, the law has never been more well-liked. Poll after poll shows that Americans widely prefer Obamacare to the various sadistic plans Republicans have put forward to replace it. Until recently, the Affordable Care Act had struggled to gain widespread acceptance for a variety of reasons: nonstop scorched-earth opposition from the GOP; built-in American resistance to more government involvement in health care; a lackluster sales plan from President Obama and other Democrats; and the law’s actual shortcomings. But once a Republican Congress and president possessed the power to actually destroy Obamacare, the party’s health-care hypocrisy was finally revealed for all to see. With its bumbling, bad-faith effort to take away health care from millions, the GOP has managed to do what Democrats never could — make the Affordable Care Act popular. Meanwhile, the once-bedrock issue of Obamacare repeal has faded as a unifying plank among most of the GOP’s rank-and-file voters. Five years ago, the Affordable Care Act had yet to begin its expansion of health insurance to millions of Americans, but Jeff Brahin was already stewing about it. “It’s going to cost a fortune,” he said in an interview at the time. This week, as Republican efforts to repeal the law known as Obamacare appeared all but dead, Mr. Brahin, a 58-year-old lawyer and self-described fiscal hawk, said his feelings had evolved. “I can’t even remember why I opposed it,” said Patrick Murphy, who owns Bagel Barrel, on a quaint and bustling street near Mr. Brahin’s law office here in Doylestown. He thought Democrats “jammed it down our throats,” and like Mr. Brahin, he worried about the growing deficit. But, he said, he has provided insurance for his own dozen or so employees since 1993. There’s more here than just the political truism that it’s almost impossible to take away an entitlement once it’s been bestowed. The reversal in public opinion cuts to the emptiness at the core of the national Republican agenda on this issue. Most important, they never grappled with the reality that the law has helped tens of millions of people. The GOP was able to get away with their alternate-universe vision for so long because, without control of the three branches of government, it could revel in a series of symbolic repeal votes without offering an alternative. Americans were also confused by the mechanisms of the Affordable Care Act when it was introduced, and indeed, the Times reports that many still don’t understand how the law works. This widespread perplexity created an opening for Republicans to claim vaguely that they could easily do better than the status quo — “something terrific,” in the words of Donald Trump. But now, Republicans control every lever of the federal government, and any illusion that replacing Obamacare would be simple has been well and truly shattered. Instead, the relentless news coverage around health care has finally revealed Republicans’ philosophy on the issue: nothing more than knee-jerk opposition to the previous president combined with an overwhelming desire to cut taxes for wealthy Americans. Propaganda works best when the enemy it conjures is hazy and easily caricatured; it works less well when everyday reality intrudes. Americans have now gotten a taste of what citizens in other industrialized nations have long become accustomed to, and they don’t want less of it. They want more.